It is difficult to single out the highlights of a truly astonishing Olympic Games for Britain’s cyclists. The eight golds so far – there could be one more from Shanaze Reade in the BMX – is beyond the wildest of expectations. While it is quite right that the likes of Chris Hoy, Bradley Wiggins, Victoria Pendleton and Nicole Cooke get the plaudits, there was real joy in seeing the unsung heroes get their rewards, or watching the next generation burst onto the scene. 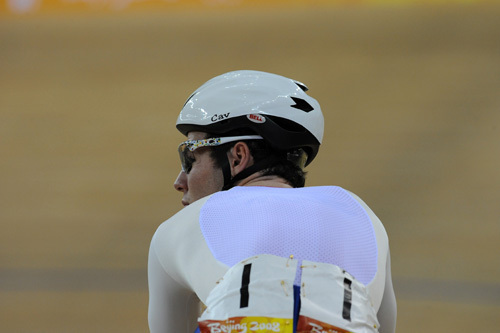 Ross Edgar’s silver in the Keirin was fantastic. Imagine how he must have felt at being left out of the team sprint trio and seeing them romp to gold. To focus on the Keirin after that was impressive and, although Hoy made his victory look easy, it was a difficult competition, with some world-class Keirin riders in it. Chris Newton’s bronze in the points race was equally impressive. Newton has had a difficult year after he crashed in training in March, broke his collarbone and was forced to miss the World Championships. He rode so smartly in Beijing to guarantee himself a medal well before the end of the race. Yes he let silver slip from his grasp on the last lap when Germany’s Roger Kluge attacked, but it was still a superb ride. Wendy Houvenaghel’s silver in the individual pursuit was a fine reward after a string of fourth places at the World Championships. And what about Paul Manning? What can you say about such a professional operator? He’s the oil that keeps the team pursuit chain running smoothly. Bronze in Sydney, silver in Athens, how fitting was it that he ends his career with gold and a new world record in Beijing. He can pass the baton on to Clancy, Thomas, Burke and the rest and say: ?There you go, lads, over to you.? Steven Burke and Jason Kenny were the young stars of the Games. Both 20 years of age, Burke won a totally unexpected bronze in the individual pursuit and Kenny won gold in the team sprint and silver in the sprint. At the time of writing, the cyclists were responsible for half of Great Britain’s 16 gold medals. Who could have imagined that ten years ago? Chris Hoy’s legendary status is confirmed. He is Britain’s most successful Olympic cyclist of all time, with four gold medals and a silver in three Games. He’s the first British athlete in a century to win three golds in one Games. He is cycling’s equivalent of Sir Steve Redgrave and it can only be a matter of time before he too is knighted. Four years ago Hoy won the kilometre time trial, then the UCI took his event out of the Olympics. So, he trained for the sprint and the Keirin and became the best in the world at those events instead. To explain the magnitude of his achievement it is important to remember that Hoy raced on every day of the track competition and was not beaten once. He was part of the team sprint team that qualified fastest in a new world’s best time. He won every race in the Keirin and he topped the sprint qualifying and went through with a clean sheet in every round. Phenomenal. But the 32-year-old is not finished yet. He wants to go on to London – and if an interview he did with CW earlier this year is to be believed, even the Commonwealth Games in Glasgow two years after that. Hoy is one of the nicest men you could hope to talk to. Friendly, not at all starry, the perfect ambassador not just for cycling, but for sport and for the country. When he was mobbed by autograph-hunters after the World Championships in March, he not only signed happily and posed for photographs, but chatted to fans far longer than he was obliged to. Already it’s been revealed that the new 4,000-seat Glasgow velodrome will be named after him. Chris won’t want the fuss and palaver and he may even be slightly embarrassed by the news, but he deserves it. The mainstream media have caught on, and the buzz phrase of the last couple of days has been: ?It’s almost as if the rest of the world aren’t interested in track cycling.? That does an enormous disservice to the progress of the British cycling team, which started out on this long journey more than a decade ago. The first time I went to the World Track Championships was in October 1999. I won’t pretend I travelled with any great knowledge of track cycling. In fact, it was the first track championships I had ever been to. We were there primarily to see the Olympic sprint. That’s what the team sprint was called before it was rebranded to avoid the inevitable confusion. Chris Hoy, Craig MacLean and Jason Queally were the British trio. They had won the European title earlier in the year. I admit, I had to check my records to confirm this but they qualified fourth fastest and knocked out Greece in the quarter-finals with the second fastest time, to set up a clash with the French. I can remember after the final, where the French won comfortably, meeting Queally, who was eating a McDonald’s. The former water polo player seemed almost underwhelmed by his silver medal. He gave the impression that silver meant little, and that gold was what they wanted. Chris Hoy’s focus was apparent. ?We want an Olympic medal in Sydney and we want to beat the French,? he said. The natural pessimist in me doubted it would happen but the pace and fervour with which British Cycling was being overhauled by Peter Keen was astonishing. They were difficult days, a time when Keen’s revolution was not being embraced by everyone in the sport. Road racing was being written off and we’d never be any good at track racing anyway, some said. Keen made bold statements about winning medals and about not settling for second best. It was all very un-British. As the British have risen to the highest of peaks, the opposition has stood still and in some cases gone backwards. British Cycling’s policy of seeking marginal gains – however tiny – in every area has put them ahead of the rest of the world. Rival nations must wilt at the sight of the British and, in some cases, they must have felt they were beaten before they even started. Jamie Staff felt the team sprint gold was in the bag the moment he saw the French trio taking the bus ride for the opening ceremony, for example. Of course, the journey doesn’t stop here. The Olympics are in London in four years’ time, as if anyone has failed to notice, and the expectations will be sky high. How can Britain’s cyclists match their Beijing haul? And, crucially, what will be the press and public perception if they don’t? It’s going to be an fascinating four years. Is it all about the money? As Britain notched gold after gold, there have been comments – some from rival nations, some from rival sports in Britain – that the success is all down to Lottery funding. I even read one comment that the Olympic ideal was being tainted a little by British Cycling’s cash-powered revolution, as if the Olympics still stood for joyous amateurism. Cycling at the Olympics went professional 12 years ago in Atlanta when they let the road pros in. Yes, British Cycling has a budget that other nations may look at with great envy, but it is important to look at the figures and put them in context. British Cycling received £7.9m of Lottery funding for the current Olympic cycle, beginning at the start of 2005 and running to the end of the Beijing Games. That is a shade under £2m per year. Two million pounds a year wouldn’t pay for a modest professional road racing team. And it wouldn’t get you one half-decent international footballer either. The Manchester-based set-up is extremely cost effective and track cycling is cheap compared to road racing, but it is still a modest expense, and one that works out at less than £1m per Olympic gold medal. It’s an absolute bargain when you also take into account the other world-class success during this Olympic cycle. Besides, spending money on sport doesn’t necessarily mean you get ever increasing returns. You don’t pour pound coins into a machine and wait while it converts them into Olympic medals. It takes talent, attention to detail, incredible hard work, hard-nosed management, blood, sweat and tears. Yes, it has enabled British Cycling to expand its infrastructure and poach some world-class coaches and experts. It has allowed them to follow a policy of leaving no stone unturned in the pursuit of tiny improvements, and it has enabled them to pay athletes so that they don’t have to combine their sport with a full-time job to make ends meet. It’s hardly expenditure of Roman Abramovich proportions, and to suggest that it’s all about cold, hard cash, is an extremely unfair assessment. During the Games, performance director Dave Brailsford told The Independent that they wanted to win gold every time they step onto the track, in every event. Part of the success story as British cycling has gone stratospheric over the past half-dozen is the willingness to dissect success and failure and examine it to see how improvements can be made. So, I wonder what British Cycling will make of the Madison. They had Mark Cavendish, roaring fit, firing on all cylinders, having prepared specifically for the Games. And they had Bradley Wiggins, who had ridden six gruelling pursuit rides, and clearly left with next to nothing else to give. Wiggins wanted three gold medals but the task of achieving it at the Olympics was a bigger one than doing it at the Worlds. Remember, in the World Championships you ride one qualification race in the individual and team pursuits and then the final. In Beijing it was two qualification races, then the final. It may only be an extra eight minutes of riding but the mental stress is enormous. It added up to a punishing schedule and because of the dilemma over how to fill Britain’s second spot in the individual pursuit, British Cycling lost its way slightly. The Madison is an unpredictable event but it’s not anarchy. It’s not a walk in the park to win but if they’d had the legs, they could have won a medal simply because of the class the pair possess. Wiggins’ endurance and Cavendish’s turn of speed – it’s a Madison marriage made in heaven, as they proved in Manchester in March. You have to go back to that individual pursuit conundrum to see where it unravelled. Geraint Thomas was kept out because they wanted to save him for the team pursuit campaign. Had he entered, he’d have been on for a medal. But that’s exactly what happened to Steven Burke, who was selected instead. The reason for taking him to the Games was to blood him in the team pursuit squad in the qualifying round, which would give Wiggins a rest. But Burke performed brilliantly and unexpectedly. He reached the first round, then the bronze medal race and suddenly the prospect of putting a 20-year-old in the team pursuit squad a matter of hours after a full individual campaign looked too big a gamble. So Wiggins was denied his morning off and was pressed into action instead. From that moment on, the Madison was always looking a tall order. Burke came away with an individual bronze, which must have been beyond his wild expectations, but missed out on getting gold as part of the team pursuit squad and, perhaps more importantly, didn’t experience the pressure of the team event at that level. Wiggins had to ride every round, using all his mental and physical energy to do so. And Cavendish, taken to the Olympics with one goal in mind, was left out on a limb. A harsh assessment, yes, and certainly not a criticism of Wiggins or something that should take away from the achievements of the rest of the British team. But when you set the bar as high as British Cycling does, when you talk about winning to such an extent, you also have to be prepared to answer the questions and address the issues when it doesn’t go right. Cavendish was placed in an impossible position and you have to feel for him. In superb condition and fired up beyond belief, Wiggins said he was practically bouncing off the walls the day before the Madison. And knowing Cavendish, he will have taken the defeat badly, because there’s nothing he hates more than defeat. Hopefully he won’t allow himself to be deflated for too long. He should think back to the four stages of the Tour de France he won this summer. But British Cycling’s management have to also accept that, while almost everything else went according to their well-honed plans, they dropped the ball on this. So, Christine Ohuruogu remembered to get to the track on time for her 400 metres final at the Bird’s Nest stadium, and she didn’t forget to attend the podium ceremony to collect her gold medal. Some sections of the press are hailing her as a hero who overcame adversity to reach the top of her sport. The three missed drug tests in the space of 18 months were negligent and she was banned for a year. The rules state that if you miss three tests you are as guilty as if a banned substance was found in your system. And the British Olympic Association’s rule barring anyone banned for a doping offence from representing the country in the Olympics is a long-standing one. That other countries do not adopt such a firm line is neither here nor there. Ohuruogu shouldn’t have been in Beijing, just as David Millar wasn’t. There seems to be some revisionism in some quarters about Cycling Weekly‘s coverage of Millar’s confession. When Millar was arrested by police and admitted using EPO, the magazine took an extremely tough line, even going as far to say that he should be hit with a life-time ban. Even his return at the 2006 Tour de France was greeted with caution because he had been slow to acknowledge publicly why doping was wrong. I wrote on the eve of the prologue in Strasbourg that the last thing the beleaguered Tour de France needed was a Millar victory. He was, after all, making his first race appearance following his ban. But when he won a stage of the Vuelta later that summer and said in the post-race press conference that he was doing it clean, on bread and water, he indicated that the penny had dropped. Signing for the Slipstream – now Garmin – team, was another statement, as is subjecting himself to the squad’s rigorous in-house anti-doping tests. And so it is regret that I still believe that Millar should not be allowed to participate in London in 2012. Reformed though he is, the rule was the rule when he committed his offence. The rule still stands now and, if there is to be no lifetime ban for dopers in professional sport, then perhaps a life ban from the Olympic Games is the right penalty to pay. Because if you nibble away at the edges of the regulations on a case by case basis, you undermine the entire anti-doping effort. I make no apologies for the fact that events from Beijing dominate the Wednesday Comment again this week, although normal service will resume as soon as possible. It is slightly unfortunate that as attention shifts away from the track in the Chinese capital and back to the road racing in Europe, it’s the first day of the ENECO Tour an event that brings on the end-of-term feeling a couple of months too soon. Don’t even get me started on the Vuelta. Every year I try to see some merit in it as a grand tour, and every year it fails to justify its status. Either ex-dopers run away with it, or a handful of the stage winners are later found to have tested positive, or the race is a total snoozefest, or like last year, it was all over and done with after the first moutain stage in week one and we had to watch Mr Anti-Entertainment Denis Menchov go through the motions for a fortnight. It’s a shame because the organisers have tried to enliven the race in recent years, with shorter, punchier stages. But the bottom line is, apart from a very small handful of riders, the rest are not there for the Vuelta a Espana. They are either recovering from injury or training for the Worlds or searching for a contract or they’re there as some kind of punishment from the team. On the plus side there’s the Tour of Britain to look forward to, until you realise that Danilo Di Luca, Alessandro Petacchi, Oscar Sevilla, Santiago Botero and, yes, Tyler Hamilton are all on the provisional start list. David Millar is too and, like Di Luca, Petacchi and Hamilton he has served his time. Is it only me who sees a small but important distinction between them? Yes? Okay then.